Adding to it's super-nifty line of terrariums, Dunecraft has an all new quintet of styles to choose from. Click through for Aliens and Dinosaurs! If you're like me, then that was probably enough to feel you on one of the new kits offered by the gardening and plant-centric company. Just in case it wasn't, there are a bunch more very cool set-ups for you to add to your indoor garden. Dome Terrariums are also designed as themed terrariums, meaning they are about more than just the plants. 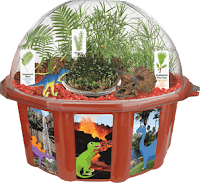 DuneCraft ties themes such as Fairies, Dinosaurs, Aliens, and more with the terrarium, which is designed to thrive for years in the original container. The idea behind this is to draw in kids and fans of these themes to get them into growing plants, and it works! The Outer Space Adventure Dome takes gardening and plants into a whole new realm, and allows consumers to grow plants that in some way relate to space. For example, the Space Plant moves when you touch it, the Antenna Plant has flowers that look like Alien antennas, and the Rocketship Plant has flowers that look like the flames emitted by a launching rocket. The kit contains themed decals, stakes, and has Space Sand that will not get wet for kids to build Lunar Lagoons, and comes complete with an Alien. The Butterfly Glamour Garden has plants that are known to attract butterflies both for food and shelter. In addition to their sweet smell, colorful foliage, and simplicity to grow, these plants will actually attract hummingbirds and butterflies. This whimsical kit comes with everything needed as well as a host of fun bling for girls to beautify their domes. There are adhesive jewels, themed decals and stakes, large jewels to place in the garden, and a butterfly to get them started. Get back on the farm with the Farmer’s Harvest Garden. The interesting thing about this dome is that it is a functioning garden and contains plants that will grow and be ready to harvest in the dome terrarium itself. In addition to the plants themselves, this garden comes complete with fencing material for kids to build their own fences, color decals and stakes, and even a farm animal to call it home. It's cool stuff. Dunecraft has been at this a long, long, time and they really do a great job with what they put together. If you'd like to get a growin' head on over to dunecraft.com to learn more about the line.